Lindsey McIntyre and Tyler Cox clearly love and respect each other. They revere their relationship and draw strength from their partnership. Simply put, they are good together. Now, as partners, they are about to embark on a bold adventure. 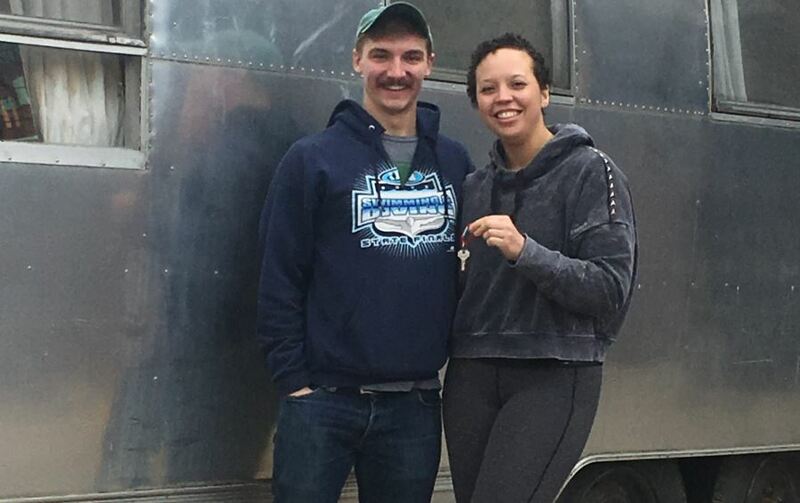 The couple plans to quit their jobs and hit the road next spring in a classic travel trailer for a year-long tour of America to, in part, pick a new place to live. The couple is documenting their build on Instagram. Cox and McIntyre removed the flush toilet and blackwater tank and installed a composting toilet in their place. They haven’t decided whether to polish the trailer’s aluminum exterior. They hope to finish the build as soon as possible and plan to live in it as much as they can before hitting the road. During the build, the couple gave away most of their possessions and has been staying in small Airbnbs to help them adjust to tiny living. 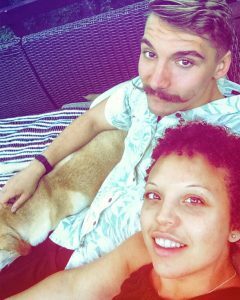 While scouting the country for a great place to put down roots, Lindsey and Tyler “hope to work with lower socio-economic status people; helping to show them that you can have a very fulfilling life with minimal possessions,” said McIntyre. “There are so many people living in poverty, who think they will never get out of it. My goal is to reach people in the community – especially people of color – to show our community how my partner and I live a very full life on a tiny budget – smaller than the one they are living on now. So many people get swept up in keeping up with the Jeffersons and Joneses, and I want to show people how that life may lead to debt, struggle, and unhappiness,” said McIntyre. 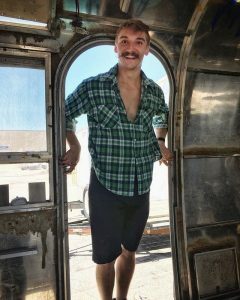 “We launched Vivarium Consulting to consult on tiny-home, particularly Airstream, builds and living minimally and debt-free. On how to live a fuller life with less stuff,” explained McIntyre, who will serve as the brand’s CEO. Cox will be the COO. “I graduated college and moved to St. Louis after Lindsey and I met on Bumble while Lindsey was traveling in my home town in Illinois,” said Cox. “Tyler has always been pretty nomadic and a minimalist. He was going to do van life and travel before we met. I always loved to travel. I lived in Morocco for a year studying Arabic. We want to start in the Pacific northwest and travel down the coast. This will give us time to check out each community as we go, and if we see a place to land, we’ll buy land and Tyler will build us a house, but it will be small. 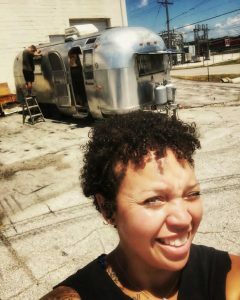 We will live in the Airstream until we find a home and then we’ll probably rent out the Airstream via Airbnb,” said McIntyre. McIntyre will complete her degree in spring of 2019 at Washington University https://wustl.edu where she also conducts neuroscience research. “We think Tyler will be picking up casual work, including, perhaps, working as a lifeguard instructor. We estimate our monthly costs will be cut by half. To reduce our gas consumption, we plan to stay each place for two weeks to a month, depending on how much we like a place. We want to really get to know places and towns,” said McIntyre. “Keeping food to eat inside the camper is a huge deal,” said McIntyre. “We like to grow our food, but that will be hard to do on the road. We plan to eat local as we travel, but eating out will be minimized to save money,” explained McIntyre. “As a child, I didn’t know it was okay to be black or bi-racial. I know that is a crazy statement, but growing up there were so many things that happened to people around me just because of the color of their skin. My family tried to protect me by straightening my hair and passing me off as white. My grandparents would keep shotguns in the house just in case. This spilled over into my teenage years. I still looked bi-racial but having blue, green eyes was unheard of around the area at that time. It was enough to pass me off as white in most circles. As a teen I didn’t know who I was and what I wanted in life. There were so many things I hated about myself growing up. I hated that my hair was “nappy” when it wasn’t relaxed and flat-ironed. I was jealous of women who had super straight hair. I didn’t have any role models that looked like me or that could really help me understand being bi-racial. I had role models, but they were either white or black, not both. A huge goal of mine is to be a role model for those who still struggle with identity issues,” said McIntyre. Lindsey and Tyler will showcase their Airstream and present their story to attendees at the Mid-Atlantic Tiny House Expo Maryland, which will take place October 6-7 in West Friendship, Maryland.